What a brilliant way to win your maiden European Tour victory by eagling the 72nd hole. That’s what rookie Scotland’s David Law did in holing a 10-foot putt for an eagle ‘3’ to capture the co-sanctioned ISPS Handa Vic Open at the 13th Beach course by a shot from Aussies Wade Ormsby and Brad Kennedy. 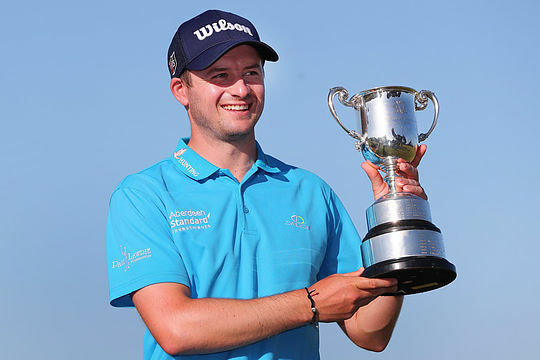 Law secured his first victory in just his fifth event as a full member of the European Tour with the young Aberdonian also becoming the first Scot to win a pro event in Australia since Colin Montgomerie won the Ericsson (Australian) Masters 18 years ago. Law, 27, headed into the final round trailing three shots behind South Australia’s Wade Ormsby and with three holes to play the Scot was trailing three shots from the lead. But that was before he birdied the 16th and then played the shot of his short European Tour career in sending a rescue club second shot at the 72nd hole to just some 10-feet right of the flag and then proceeded to calmly roll-in the eagle putt. It sent Law into a share of the lead with Ormsby at 18-under but when Ormsby double-bogeyed the 17th, it meant ‘Orms’ needed an eagle of his own up the last to force a play-off. However, the 38-year old could only manage a birdie and Law secured a one-shot maiden Tour triumph. “Well, we needed to make eagle and I was kind of in between clubs so I thought a hybrid was probably too much and 4-iron wasn’t enough, so we needed to hit hybrid and take a bit off it and try to get it close and luckily it paid off,” Law said. After qualifying for the main Tour from the Challenge Tour, Law arrived ‘Down Under’ having teed-up in just four events this season and hardly setting the Tour on fire making the cut in his opening two events that included a 71st place in the Hong Kong Open and then a T26 at the Alfred Dunhill Championship. Following the Christmas break the Scot headed to Abu Dhabi to miss the cut and then after a week off, Law teed-up in Saudi Arabia also to have the weekend off, and in those 16 rounds, Law had played on three different continents and had never managed an eagle. Now after his first European Tour success, Law can virtually ‘pick-and-choose’ where he now cares to play for the remainder of the 2019 season. “It’s massive. It’s not something I expected. For me just being out here playing on the European Tour was enough,” he said. Law is headed across the Australian continent to Perth for next week’s second co-sanctioned event, the Perth Sixes but laughed he’s in no rush. “I’ll probably celebrate having 12, 15 pints tonight…I’m not flying to Perth until 1.30pm tomorrow, so we’ll certainly have a few,” he said laughing. Law is just the fifth non-Australian to capture the Victoria Open and now joins six Major Champions, four of them Open winners (Peter Thomson, Gary Player, Kel Nagle, Greg Norman and Ian Baker-Finch) in winning the event first staged in 1957.